We secure expedited U.S. passports for U.S. citizens. Passport services are available in as little as 8 hours! Traveling for vacation, tourism or business trips, ItsEasy can secure Chinese visas quickly and easily! Brazilian tourist and business visas can be made simple and easy - get your Brazil visa today! Getting your Indian visa doesn't have to be hard; let ItsEasy help you, and get your tourist or business visa fast! Placing your order takes just a few minutes: you will indicate when you need your passport or visa in your hand, provide contact and shipping information, and check out with a credit card. We will provide you a simple list of necessary documents, the correct passport or visa application, and a FedEx airbill so you can ship everything to us for review and processing. Based on the services selected, you'll receive your passport or visa in as little as a few days to a few weeks . If there are any issues along the way, we will work with you to resolve them quickly. 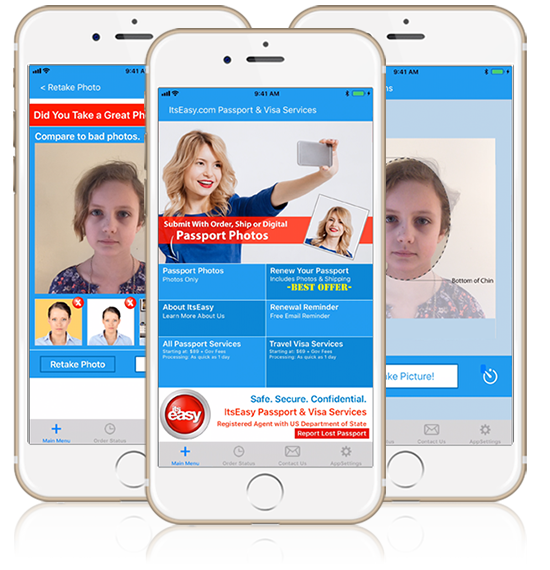 Founded in 1976, ItsEasy Passport & Visa Services is a U.S. Government registered passport and visa expediting company which has processed over 2 million passport and visa applications. We specialize in securing expedited U.S. passports and business and tourist visas for U.S. citizens or non-U.S. citizens residing in the United States of America. Passport and visa services are available in as little as 6 hours in some cases. For emergency passport or rush visa services, please contact our office 24 hours a day at 1-866-ITS-EASY. 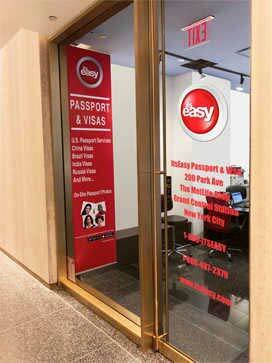 ItsEasy Passport & Visa is a Registered Agent with the U.S. State Department. That means that we can interface with the U.S. Government on your behalf for obtaining a passport: we act as your agent, allowing us to submit your passport applications on your behalf. If there is a problem with your passport application, we can interact with the U.S. Government agencies on your behalf to resolve problems and obtain your passport, usually without extra (significant) effort on your part. Like a tax accountant, we help the processes go forward, pre-review your applications to make sure they are correct before they are submitted, and provide you with the piece of mind that you have professionals on your side when requesting these important Government documents. Expedited Passports are our speciality. Our Grand Central Station-based Passport Team are experts at getting these hand-delivered passports both in New York and in many other locations around the country using our nationwide team of processors and couriers. We also offer Concierge Services for those that wish to have 1-1 assistance from our awesome Concierge Team. Can you get an Expedited Passport on your own without a company like ItsEasy ? Post Offices do not do true Expedited Passports. Their "expedited" mail-in service is actually 2-4 weeks - and if there's a problem with your application, you can expect the delays to be considerable to resolve. If you have a trip coming up, this is definitely not the way to go! There are U.S. Government Passport Agencies located around the country. Perhaps you live near one (and perhaps you don't!). You can try to make an appointment at one of these Passport Agencies to get an expedited passport yourself - but without using ItsEasy, you face the same problem - has someone reviewed your application to make sure it is correct and ready for submission? As a Registered Agent, ItsEasy has direct access to the Passport Agencies to get your expedited passport without appointments and ... we almost forgot ... having to go yourself and wait in line! For obtaining travel visas, ItsEasy has offices in New York and Washington, DC, key cities to obtain travel visas for just about every country you may plan to travel to. Similar to our Passport services, we review your Visa Applications to make sure they are correct before submissions (incorrect applications can cause significant delays in obtaining a visa), and we deliver your applications to the Embassies or Consulates to obtain the visas on your behalf, as your agent. We wait in line so you don't have to! Perfect for Passport or Visa Application Photos! No running to the pharmacy to get your photo! FREE with ItsEasy Passport & Visa Orders!